Over the last few days I have received notifications of new blogs posted by various L&D professionals. As I opened one after the other I noticed a very alarming trend. We are in L&D and we advocate short sharp bits of information for our learners. We tell our designers that people should not be made to read longer than 10 mins during a learning session. We advocate modularisation of learning. We speak about chunking information into small pieces. So I open the first blog and what do I see over 3 pages of writing. I open up the next one, over 4 pages of writing. So I give up and guess what, unfortunately I don’t read any further. Now I know I am new to blogging and that there are more qualified people out there to talk about blogging, but one thing I do know, if you are expecting me (and maybe others) to read 3, 4 or 5 pages of writing then I think you need to start practicing what you (and I) preach. This is why Twitter is also so successful – because you only have 140 characters to say what you want to say. If you want your blog to be read and be successful think about been brief and succinct – would you ask one of your learners to read what you just wrote and is this the right length/amount for the message you wish to convey. If not then do a part 1, part 2 or even a part 3 but don’t write reams and reams because not many will be reading it. Towards Maturity Benchmarking: How to realise potential of online learning in 3 easy steps! Please join us on Tuesday 8 July at 8:00 p.m. (AEST) or 11:00 a.m. (BST) via our Ozlearn tweet chat by following the hash tag #OZlearn. How to realise potential of online learning in 3 easy steps! But these are also challenging times. In our studies we found that 9 out of 10 Australian L&D Leaders are looking to their technology enabled learning strategy to improve talent management and performance, deliver greater value for money and speed up the application of learning yet fewer than one in 5 are delivering those benefits . The same study analysing feedback from participants around the globe showed that the top learning companies were reporting more engagement, more productivity and more results than their peers. It is clear that our learning strategy has the potential to achieve so much more but many L&D professionals have very little time or money to invest in change. So how do we realise the potential of online learning, save resources AND make great decisions? Benchmarking your approach against peers who have already achieved what you are looking to do can really help. Act on what you find out! It is that simple so why not click here to start benchmarking right now. Using these 3 simple steps to deliver quick wins – faster! When it comes to engaging staff with online learning, exploring mobile or performance support strategies we have to focus on the quick WINS – with the emphasis on wins! I appreciate that making mistakes in our decisions and approaches is all part of the learning curve but when resources are tight, a little bit of reflection and preplanning can help you increase your chance of success. Benchmarking, using the 3 simple steps above, can be a great way to help you realising the potential of online learning. And I don’t mean comparing the number of hours spent training or spend per head – the only action that leads to is to increase the size of the begging bowl! Effective practice benchmarking means learning from the mistakes and successes of others in order to help you establish more informed decisions and priorities. Events, case studies and even connecting through #Ozlearn are a great way to do this but when the chips are down, we need a more systematic evidence based approach to help support decision making and action planning. Over the last 10 years Towards Maturity have gathered information from over 3000 companies from the public, private and not for profit sectors around the globe to help investigate what works in a successful e-enabled learning strategy – and what doesn’t! 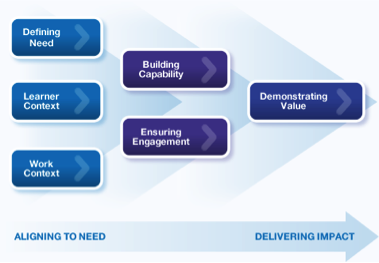 There are a number of characteristics that define the most successful L&D teams – their proactive understanding of both the needs of both business and individuals, awareness and influencing the work context, building the L&D team’s skills to design great learning and performance support, managing change and demonstrating value (see figure 1). Funnily enough, the budget and types of technology used does not influence success in the same way. We’ve seen charities and public sector organisations lead the way with very little resources, delivering a massive impact by addressing these 6 simple areas in their strategy. However we’ve found that whilst successful practices are common sense , they are not common practice! So I’ll leave you with a few questions! How does your approach to delivering L&D compare with your peers both in Australia and in the UK? What can you learn from top performing learning companies to help you plan more effectively and deliver quick wins first time round? When was the last time you stopped and seriously reflected on the approach and performance of your L&D team? We invite you to take an hour out to use the Towards Maturity Benchmark to reflect today. The whole process is free, confidential and backed by leading thinkers in the L&D industry around the globe. What’s more, you will receive a free Personalised Benchmark Report (valued at £300) to provide you with your own data to build your strategy on in September. Plus you will be able to download a new global briefing paper that explores the implementation strengths of the UK and Australia and highlights a number of lessons that we can learn from each other to improve impact and business engagement. These reports are FREE to all participants of the Towards Maturity Benchmark, and provides a great opportunity to compare your approaches with peers in your own country. Why not take time out to reflect on your strategy by benchmarking today!